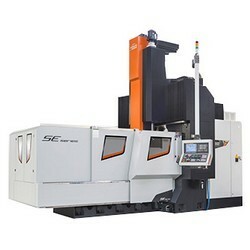 MSE series is particularly designed for machining delicate mold and aluminum alloy. With the ultra-wide column structure providing best rigid support, SE is able to meet requirements at high speed, high accuracy, high efficiency, and mass aluminum chip removal. 1.X, Y and Z axis equipped with Direct-Driven transmission that combine the backlash-free gear box. 2.Z axis equips twin screw system with hydraulic counter balance, providing quick response speed, screw and motor service life extended. 3.High-angle automatic sheet metal remove chips easily. 5.With a deeper groove to outfit a big diameter chip augur ensures efficient chip removal.